The on-site kitchen serves three meals a day, focusing on delicious Southwestern home-style cooking. For breakfast, there is a Continental buffet and an extensive cook-to-order menu. The lunch buffet has hot and cold entree options, multiple sides, salads, and cookie bowl. Appetizers are served in the bar every night before dinner, a wonderful way to socialize with other guests and exchange stories. The self-service bar is operated on an honor system, where guests chit what they drink and then added to their bill. It is fully stocked with wines, beer, the famous "prickly pear" margaritas, spirits, sodas, and water. 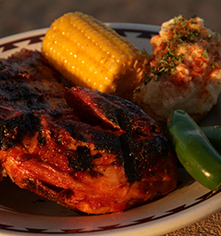 Dinner is served buffet style, with entrees grilled outdoors three times a week on the historic grill over Mesquite charcoal. Guests can usually find the ranch owners grilling and serving steak, ribs, or chicken on the main patio. The Saturday night roast beef dinner is cooked entirely in an 'Indian oven,' based on an Indian bread oven. 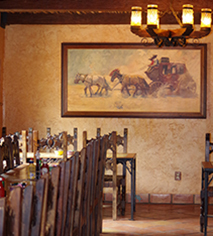 Meals can be enjoyed in the historic dining room, with its exposed adobe from the original ranch house, and saguaro rib ceiling from ribs collected on the ranch. 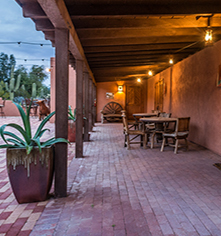 The beautiful outdoor Spanish-style patio is also a wonderful locale to congregate and dine. Entertainment is offered every night after dinner, including cowboy singers, line dancing, art class, and astronomy. Snacks are always available, with fresh fruit, chips and salsa, peanuts, and the famous homemade trail mix. Coffee, cappuccino, hot chocolate, hot and cold teas, and lemonade are available all day. Surely not to be missed are the specialty horse rides with meals. The breakfast ride includes scrambled eggs, potatoes, and blueberry pancakes, all cooked outside at the desert cookout site with stunning views of the mountains. The lunch hay wagon serves hamburgers and hot dogs cooked over a fragrant Mesquite fire with all the trimmings. The Wine & Cheese and Beer & Cheetos rides are horse rides to different corners of the ranch, dismount to relax and enjoy drinks and snacks, and remount to ride home.